In appreciation of the sweet words of comfort from friends – so many across the world who only knew of SB from my jabbering on about him, and my sharings online – I shall take recourse to pass on a few memories of a life truly and deeply well lived, of the passing at age 92 of my ‘guru’ of the last almost 20 years, SBD de Silva. …I shall start at the end. As his body was relegated to the flames at the Nedimala crematorium, there was a terrific explosion! Was it the expensive pacemaker recently inserted, perhaps uselessly, at great private cost, or was it, as a friend insisted at that moment: SB’s powerful brain – pressure finally released, albeit post-mortem! Indeed, he was of tempestuous core and mind to the very end. When we last saw him, we argued with a dear friend, shouting heated words across SB’s hospital bed, about China’s role in the world, as he lay there listening – animated as always by debate! The last vivid words we heard tumble from SB’s lips, even as he vehemently refused food, were: “Capital accumulation! Capital accumulation!” Perhaps to remind us to focus on Lanka’s own priorities! Truly, this would be one of SB’s lasting legacies: Broadly, he identified two types of colonies in the world of the 20th/21st century: settler colonial countries (USA, Canada, Australia, et al), and non-settler colonies (to which Sri Lanka and much of the world, belongs). For within such non-settler colonies as ours – a class dedicated to ‘capital accumulation’ has not been allowed. SB repeatedly maintained: a class dedicated to ‘capital accumulation’ would not waste its time on low-skill plantations, on tea-and-bed-making tourism, on the fake business of ‘primitive’ manufacture (garments, etc., where we make none of the basic materials), or on rentier capitalism (making money from money or land). We must focus on modern machine industry, providing people with new skills offering pride, vocation, belonging and security, to build a truly independent nation. The private sector, which monopolizes Sri Lanka’s resources, clearly cannot provide this. 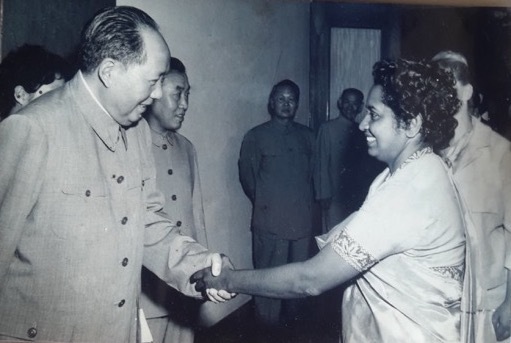 There were two great ‘political economists’ of the 20th century in Sri Lanka, both almost erased completely by the ideological machinations of the popular mass media and educational system: the two Silvas,: GVS and SBD. 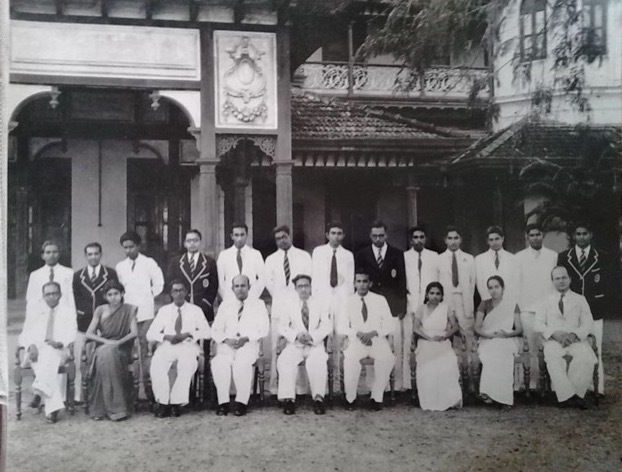 SBD De Silva is at the centre, back row. GVS wrote two classics: Some Heretical Thoughts on Economic Development and Socialism or Barbarism. 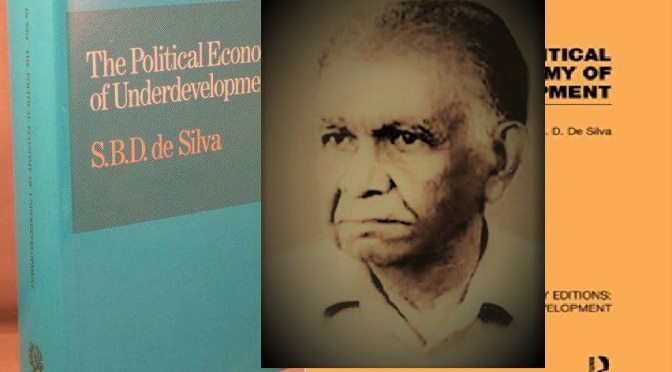 While GVS is considered ‘”more political than economic’”, it is SBD de Silva, author of the classic The Political Economy of Underdevelopment, who really focussed my mind, my poetry (and my attempts at writing a history of the world with Lanka at its centre!) towards the study of the ‘bourgeois science’ of economics. in the 1960s. SB was unable to join due to his work at the Central Bank. SB could quote verbatim: economic writings from Ricardo and Marx to Joan Robinson (visiting SL in 1959), tales of his days at the Central Bank (where he was investigated as a ‘communist’ by the father of a famous Booker-Prize-nominee who writes not of such drama), of being secretary to the Ministry of Industries (under the much-maligned 1970-77 government of the world’s first female head of government, Sirimavo Bandaranaike, which attempted basic industrialization midst great obstacles), even hilarious lines of poetry (“A poor beggar put his clothes out to dry / A rich beggar came and stole them / I don’t know why?“), as well as his interest in movements of class, of feminism (Does just cutting hair short, or admission into the ’nurturing’ cloisters of the medical guild, really signify progress for women? ), and the neccesary role of a powerful nation state. One theme, both SB and GVS kept returning to, was the nature of our economy, where the mass of the people are still cultivators. To SB, rice cultivation has an elastic demand for workers, depending on the season. In industrialized countries, ‘surplus’’ agricultural workers, are used to make modern industrial products, in their villages. For example, the touch screens on the latest cell phones are made in East Asian villages. On a more personal note, he taught me the ‘basic science’ behind Sri Lanka’s wonderful cuisine, teaching me how to make a quick meal of red rice and parippu (ironically now imported from Canada’s Saskatchewan lands stolen from the original people who were starved out of it) and thibbatu (better than green peas), adding rampay (pandanus, which gives rice that basmati flavor) and a crushed clove of garlic, which every time I add shall always invoke SB’s practical brilliance! And as I meditate on SB’s legacy, and I hear more from dear friends, I shall continue to write about his work. Why Vote At The Next Presidential & Parliamentary Elections? Yes pl. write on.. we need political economic analysis like SBs NOW; on Sri Lanka’s continued under-development and local and global pandemic of corruption aka. pay to Play that is the root cause of Lanka’s current Debt trap. (Fake) Development Aid experts and projects are reason for growing inequality and resulting violence/ scapegoating of minorities..
NeoLib. economists are part of the problem of Fake Development and conflict, which was long ago critiqued as under -Development or “colonialism by other means”. Fake dev. is evident from China’s white elephant airport in South and US/MCC Compact/ IMF fake aid and Xperts at Bondscam RW’s office.. I may be a little strange ……. but simply put …….. I ain’t no fan of a country with great economists and a lousy economy. Did he ever compare Sri Lanka with Singapore and Taiwan, in its economic development, education and and capital accumulation? The mean IQ of Sri Lanka is 79 whereas for Singapore 108 and Taiwan probably 106 or so. This book starts with the ‘hypothesis’ that differences in IQ are (partly) responsible for differences in national wealth around the world. It ends with the claim that the gap between rich and poor ‘will be impossible to eradicate’ (p 195). In between is a remarkable creation and moulding of data to show the statistical correlation the hypothesis requires. But there is circularity in the whole exercise. As the authors acknowledge, national wealth reflects industrial development, which requires an ever-expanding middle class, and IQ scores simply reflect middle class membership. IQ has long been debunked as a measure of anything. Singapore and Taiwan are front offices of imperialism, and they were allowed industrial strategies. 60% of Singapore companies are state-linked….etc..
May be he was aware of the handicap Sri Lanka faced in the quality of the human capital. Figure 1. Per capita GDP vs. national average IQ. The regression line is shown in red. The correlation coefficient is 0.73. Notice how GDP is positively correlated to average IQ. The correlation coefficient is 0.733, IQ explaining 54 percent of the GDP variance. Values this large are rare in social science. Figure 2. Per capita GDP by racial group. “White” here means European white; “East Asian” means the racially homogenous polities: Taiwan, South Korea, Hong Kong, and Japan. The four, Taiwan, Japan, South Korea and Hong Kong, all with homogeneous populations, have the highest IQs reported here. We might therefore expect them to be among the wealthiest of nations. Their numbers, especially those of Taiwan and South Korea, however, tell another story. With average IQs of 104 and 106, respectively, per capita GDPs of about $13,000 seem much too low for Taiwan and South Korea. In SL, people with a vision are very rare. And the people with a vision for economic success are just few. And so far, such people never went onto top seat of the country because we have a democracy with 90% of educated and uneducated lazy idiots with low IQ who go for rally talks, party, family, religion etc. How many of our people have dreams of their own life, let alone country’s dream? Many think that they were born to make a day’s living and have some drinks, rest. How many hours a person having to travel to work from 20KM away, wastes on the roads daily? When we start to think time is more valuable than money, we will change. Krishantha, a superb piece on SB. Could you please elaborate on GVS being denied a post by Sir Ivor? That’s fascinating. Dayan, It is indeed fascinating, ad needs fleshing out. I shall try and make it the subject of another article? Singara Club – BTW, Putin dislikes the bogus Dr Dye-Yarn. This bugger’s appointment may not take place. 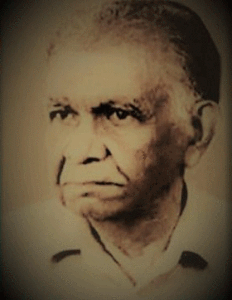 Singara Club ~ “Ceylon’s best economist was Prof HADeS Gunasekara”. Prof HADeS Gunasekara was very ordinary & pedestrian. He was the creative thinker behind the Lankans living overseas compulsory remittance scheme. This was an absolute flop. “………….when is the flight Dayan (Moscow)”? But somebody in ct earlier said Dayan’s bags are packed to go? Krisantha Sri Bhaggiyadatta: SBD De Silva had some strong opinions like “Capital accumulation! Capital accumulation!”. Sorry one fails see how it makes him one of Sri Lanka’s Greatest Economists. Krishantha, obviously some of your reader haven’t understood you. Perhaps it is better to say that GVS and SB de Silva were Sri Lanka’s two greatest Political Economists. As for others, I would say that intellectually, Dr Lal Jayawardene was superior to HA de S.
In terms of Development Economics and Development Economics, Dr Gamani Corea and Godfrey Gunatilleke were superior to them all. The test is not merely local reputation; it is international impact in the respective intellectual field: which of them has been published and/or referred to in the relevant international literature. Certainly GVS, SB, Dr Corea, Godfrey and Lal were. Dr. Dayan Jayatilleka, despite having such goof economists, including perhaps Dr. N. M. Perera (? ), since 1948, why is Sri Lanka, the Land of Native Veddah Aethho, illegally occupied by the Paras, is in such a sad economic state with debt over 85% of GDP and rapidly approaching 100%, in your opinion? CORRECTED despite having such GOOD economists,. Do you live indoors? Use transportation powered by gasoline? How about buy food, you do that right? And not to get awkward or anything, but you do wear clothes from time to time, right . . . right? “The rules of the economic game have radically changed”. The Top 50 Economists from 1900 to the Present! Presumably the answer to these questions is yes. If you partake in any sort of interaction with modern civilization you are constantly acquiring goods and services in exchange for some medium, a medium we call money. Money provides a way for us to acquire what we want from others without engaging in violence or coercion. It enables two strangers who have no reason to trust each other to efficiently, often almost instantaneously, work out a deal that benefits each other and then separate and go about their day. But what is money? Where does it come from, and who decides how it is distributed? These questions strike at the core of society. Whatever position your government and context take towards the nature of economics has incredible impact on your daily life and whether your goals come to fruition. Consequently, the study of economics in recent times is both very important and controversial. The old world economy base of Brittionwood accord sing in 1945 led by US headed UK . It has created new IMF World Bank and GATT has been replace in 1995 by WTO after long deliberation. Since 1990 new Globalization has upside down world economy, that capitalisms having role play on going democratic revolution . The time of GVS and SD was living most of their third world countries were dominated by simple commodity productions. World has change by PRC since 1978 economic reform by China. We have to have new reading of Global Economy in new dialectical point of view . I do not believed is that reading of modern political -economy and fundamental economy base has under gone trough vast changes in globally has not that which taken into account by DJ? Indeed all major nation economy shifted from CMC into MCM by financial market, stocks- capital and investments are under the Private Empire of MSC of USA UK EU and Japanese are still dominated via IMF, WB, ADB and other Wall street Investments Banks. The 2008 collapse of Wall Street financial market and its crisis has been deepen economy was not recovered ,but instead of that USA, UK EU and Japan has printed trillions of paper currencies (US $ , UK Pounds, EU of Euro and Japanese Yen) which in terms of trillions dollars, Euros Pounds and Yens by all their central Banks have unlimited amounts . By using power of political hegemony of USA point of policemen and their alliances has an open path of vandalism to the whole world Economy. By and large situation of anarchism of uncertainties has been created to be replace of which is ongoing undermined democratic norms of World ? In my point of view this is threaten to normalization of and growth other nations development of sustainability capitalism . On current Economy of market segment has been that shifted from developed capitalist nations into emerging nations leading market economy which combine state own that reform by PRC since last 40 odd years. It has an open new venture for global order by BRICS. In China do they shakehand in left?